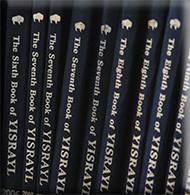 The Men’s Law Class covers The Books of Yisrayl. These books are transcripts of the hundreds and hundreds of sermons given by Yahweh’s Last Days’ Witness named Yisrayl Hawkins. In them are found the Words of Life and the only way to obtain salvation. They cover a variety of subjects which are vital to understanding and practicing if one is wanting to have the means to gain eternal life. In them you will find such subjects as what is lawful to eat as food, as well as finding the reason why you as a human being were created by YAHWEH our Creator and Heavenly Father. The many details of the prophecies come to life as we cover the words of our Pastor and Overseer as he expounds on the Holy Scriptures clearly bringing out their meanings in an easy to understand and precise way that even a child can understand them. No longer do we have to remain in the darkness as his teachings bring forth the true light to this sinful world pointing out what sin is and what must be done if we desire to have salvation through Yahshua Messiah. And don’t forget to join us for LIVE STREAMING of these classes every Roman Friday Evening at 7pm CST so you can learn and grow with us! Please click here to VIEW or DOWNLOAD the Men’s Law Classes.